Hotel: free parking, breakfast in bed, mini-mart, tea/coffee in lobby, business centre, 24-hour front desk, cleaning services. Room: free WiFi, pets allowed, non-smoking, air-conditioning, seating area, kitchen, microwave, refrigerator, stovetop, coffee/tea, ice service, flat-screen TV, armchair, dining table, ironing facilities, bath, Neutrogena toiletries. Click for details on rates and deals at My Place Hotel-North Las Vegas, NV. My Place Hotel-North Las Vegas, NV is a 2-star hotel not far from Nellis Air Force Base. Independently owned and operated, it’s also Nevada’s first hotel from the My Place franchise that was constructed in fall 2017. Each room is equipped with a kitchen and together with other onsite amenities and services, this family-friendly lodging fits well for both short and extended stays. Click to book your Las Vegas show tickets. This four-story property has 63 guestrooms with one or two Queen pillow top beds, including accessible rooms. They are all pet-friendly and non-smoking, accommodating up to four guests in each. While the interior design is not My Place’s biggest draw, the newly-built hotel will unlikely show signs of significant wear and tear for years to come. Some of the room amenities included with your star are free high-speed WiFi, flat-screen TV with premium cable, and full kitchen with a refrigerator, a two-burner cook-top, a microwave, as well as a coffee maker and a toaster. Moreover, this Las Vegas hotel also has a complete lineup of cookware and utensils available for purchase anytime at the onsite My Store. Ice-service and daily housekeeping are available too. Washing is also not an issue with their 24/7 onsite laundry facilities. My Place Hotel serves breakfast in bed, which you can pick from the menu at check-in so that pre-packaged breakfast will be delivered to your refrigerator the previous day. Guests can also help themselves to free coffee in the lobby. Both the mini-mart and a grilling pavilion can be found on the premises. 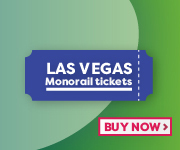 Click to buy your Las Vegas monorail pass. Parking on the premises is free of charge for guests, who can also use a complimentary business center with a PC and a printer for added convenience. Although it’s about a 15-minute drive to Downtown and 20 minutes’ drive to the Strip, gambling is accessible for there’s the Cannery Casino just across the street.